PagerDuty, the leading DevOps SaaS company focused on “digital operations management”, filed for a $100M IPO (the amount is usually a placeholder). Morgan Stanley is leading the offering and the company plans to trade under the symbol “PD” on the NYSE. PagerDuty’s mission is “to connect teams to real-time opportunity and elevate work to the outcomes that matter”. PagerDuty describes their product as the central nervous system for the digital enterprise and for digital operations. The company calls out the importance of delivering great digital experiences to end customers — and without a platform like PagerDuty to ensure applications are working and teams are collaborating — companies can lose revenue, customers can churn, and companies can have their reputations damaged. Businesses cannot afford to have downtime in today’s digital world. PagerDuty is still largely a single-product company today; they started in on-call operations for developers to help identify and manage downtime incidents, and have since expanded the product to become a real-time operations platform that has features across event intelligence, incident response, business visibility, and analytics. PagerDuty has almost 11,000 customers and 350,000 paid users. The company was founded in 2009 and is based in San Francisco, California. PagerDuty has 524 full-time employees. On-Call Management: PagerDuty’s flagship product offering where most of their revenue is derived. It enables companies to automate and orchestrate identifying, triaging, managing incidents, as well as responses. For example, if a website goes down the product will intelligently automatically ping (regardless of channel) all the relevant people to help fix it. It is used across the web and mobile. Event Intelligence: Uses machine learning to correlate and automate finding incidents from large amounts of event data. Also learns from previous events to help companies find out when things go wrong. 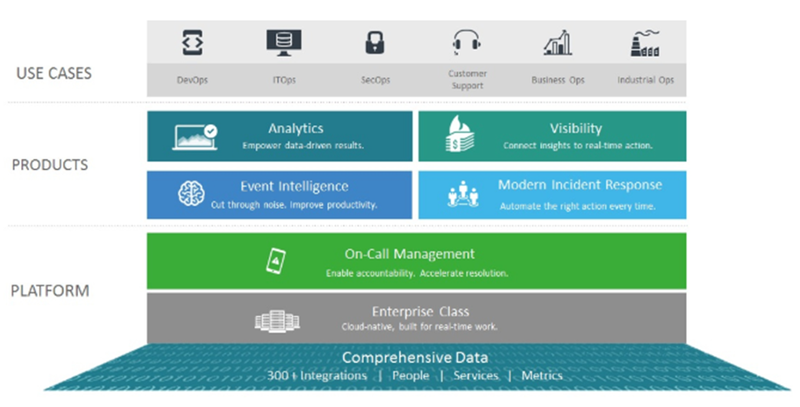 Modern Incident Response: Expands the On-Call Management product and includes automation features, learning, best practices, and enables smart responses. It can orchestrate engagement around an incident. Visibility: Provides customers with a real-time view of operational health and business impacts of incidents as they occur. Analytics: Data analytics product that combines machine and response data with business metrics to quantify performance, impact on customers, and costs to the business. Box uses PagerDuty to help ensure that its services are always available to its customers, leveraging PagerDuty Modern Incident Response to run automated response plays that enable teams to mobilize faster and take action in real time. GoodEggs uses PagerDuty to enable warehouse operations and development teams to analyze signals from refrigeration units to ensure food stays fresh for deliveries. Okta uses PagerDuty for its digital operations to remove friction from the incident response process so that teams can identify, escalate, and resolve incidents while mitigating customer impact. Slack leverages the PagerDuty platform to orchestrate real-time response across teams to maintain high availability and reliability for its millions of users across the world. Below is an output of PagerDuty’s platform. Note that PagerDuty only discloses one full year of results (FY’18) and two 9 month periods. There are many metrics and areas left blank in this initial S-1 which will be filled in by the next S-1 amendment(s) in the coming weeks. $107M in LTM revenue. 10,806 customers across 90 countries. 33% of F-500 companies are customers. 350,000+ paid users. The average customer pays them $11.6K per year (taking implied ARR / total customers). The average user pays ~$30/month. The average number of paid seats per customer is 32. No single customer represented 5% or more of revenue for the fiscal year ended January 31, 2019. 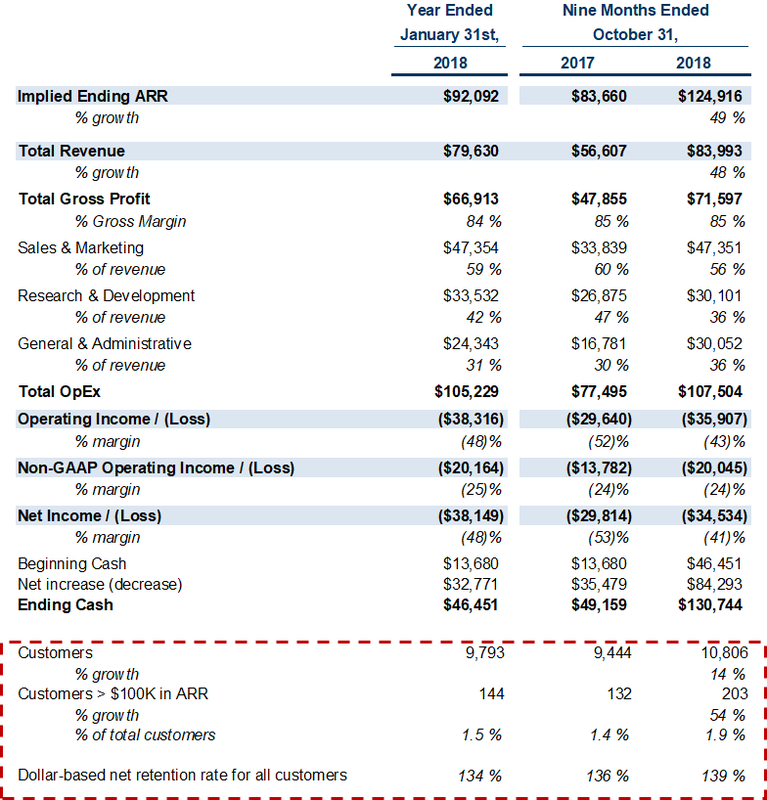 203 customers pay more than $100K in ARR, representing ~2% of total customers. 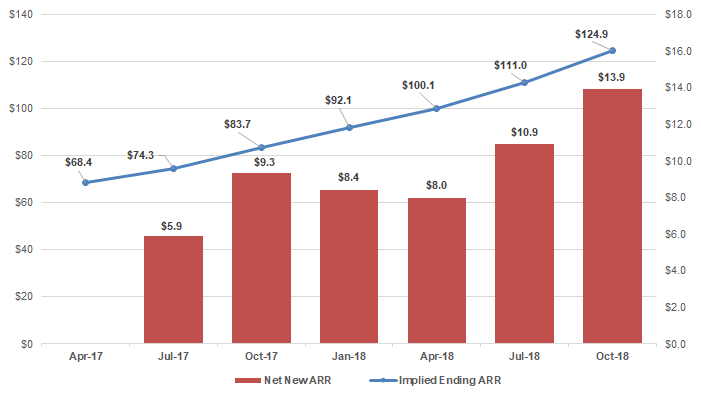 For the nine months ended October 31, 2018, fewer than 5% of customers with greater than $100,000 in ARR were new customers, which reflects the land-and-expand nature of the business. Their dollar-based net retention rate has consistently exceeded 130% over the last three fiscal years. 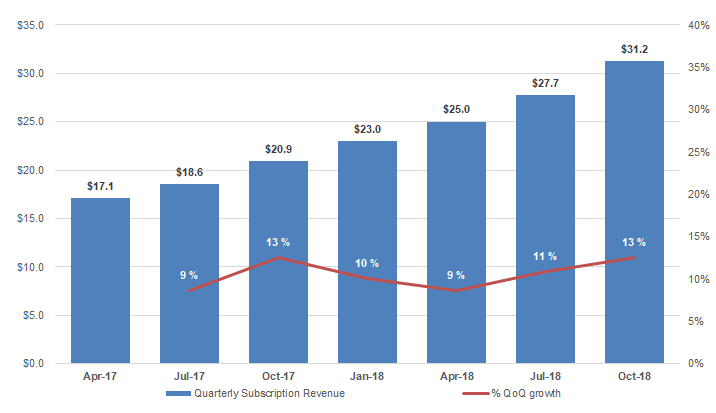 ~90% of the increase in revenue in the 9 months ended Oct-2018 was attributable to growth from existing customers, and the remaining ~10% of the increase was attributable to new customers. New customers grew 14% YoY in the same period. Contracts are typically 1 year but range from monthly to multi-year. PagerDuty runs entirely in production, with no maintenance windows, and has delivered 99.99% uptime to customers over the past 24 months. 7 issued patents and 6 patent applications pending in the U.S. The first fiscal quarter of each year is usually the lowest billings and bookings quarter. Billings and bookings during the first fiscal quarter are typically lower than the prior fourth fiscal quarter. In 2015 a database containing user information was compromised by a hacker who bypassed several layers of authentication. International customers generated 19% of total revenue in FY’18. 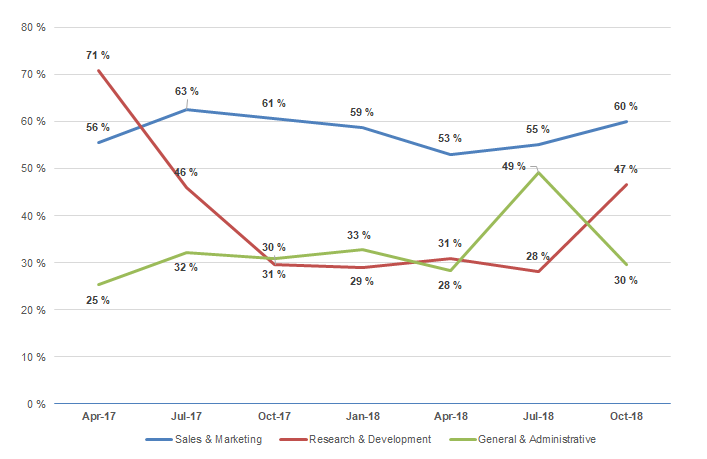 Sales reps are expected to ramp in under a year. Sales commissions for initial contracts are deferred and then amortized on a straight-line basis over a period of 4 years. A large online retailer can lose up to $500,000 in revenue for every minute of downtime (PagerDuty data). As of January 31, 2019, PagerDuty had a Glassdoor rating of 4.5 out of 5 and 100% approval rating of their chief executive officer. The company also has a diverse workforce; 50% women on the executive leadership team, ~40% women in management roles, and over 25% underrepresented minorities in management roles. PagerDuty has a very efficient go-to-market. They use a self-serve strategy and have a 14-day free trial — most customers start with a free trial and increase their spend over time. They complement the self-serve business with an inside sales team for mid-market and SMB customers and a field sales team for enterprise customers. It’s likely a highly predictable business as almost all revenue comes from existing customers — ~90% in the most recent annual period. For example, total customers only grew by 14% YoY for the nine months ended Oct-2018, but revenue grew 48% in the same period. PagerDuty has 4 pricing options; Starter, Platform Team, Platform Business, and Enterprise. Customers are able to add on products, including Analytics, Visibility, Event Intelligence, and Modern Incident Response to any subscription pricing level. Pricing from their website is below. PagerDuty states that every business is going through a digital transformation and that their platform addresses every team member involved with the development, delivery, and operations of the digital experience. They believe there to be ~85M potential users in the developer, IT, security, and customer support segments, which includes 22.3M global software developers, 18M information and communications technology skilled workers, 43.7M customer support and success workers and 1.2M security operations workers. They calculate their total market to be $25B in size by multiplying their average revenue per user by the 85M potential users — that comes out to ~$25/month/user. They think they’re less than 1% penetrated today. PagerDuty is operating in an increasingly important market — as every company becomes a software company they need solutions like PagerDuty to operate their digital assets. While they believe they mostly compete with in-house solutions and manual processes, other primary competitors include OpsGenie (acquired by Atlassian in Sep-2018 for $295M), VictorOps (acquired by Splunk in Jun-2018 for $120M), and to a more limited extent ServiceNow. PagerDuty believes they have the best product and clearly are the largest standalone company in digital operations management. According to Pitchbook and their S-1, the company has raised $173.7M to date from investors including Accel, Bessemer, Andreessen Horowitz, Baseline, T. Rowe Price, Wellington, YC, Harrison Metal, and others. 5%+ pre-offering VC shareholders include Andreessen Horowitz (18.4%), Accel (12.3%), Bessemer (12.2%), Baseline (6.7%), and Harrison Metal (5.3%). PagerDuty’s CEO, Jennifer G. Tejada, who joined the company as CEO in Jul-2016, has a 6.4% pre-offering stake. Their last round was a $90M series D led by T. Rowe Price and Wellington Management in Sep-2018 at a $1.2B pre-money valuation, according to Pitchbook. As I noted earlier, PagerDuty is growing quickly and efficiently. While customers start small, they tend to grow their spend over time in a consistent manner. Given most of the new revenue comes from expansion — they had a dollar-based net retention rate over 130% over the last 3 fiscal years — it’s likely highly predictable. 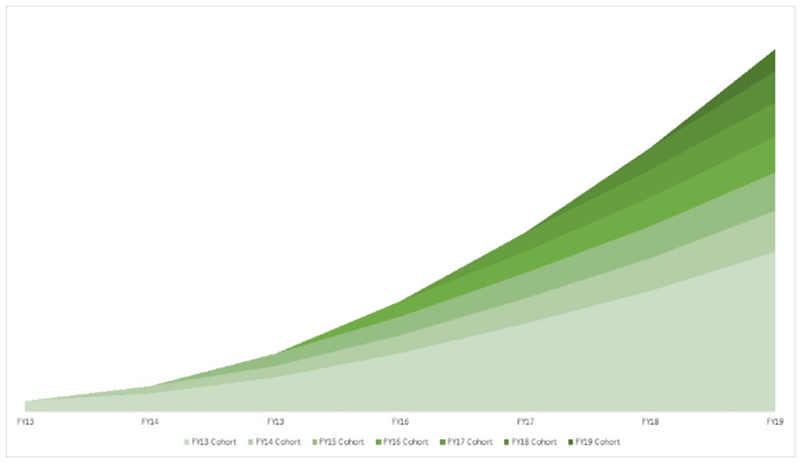 PagerDuty could probably shut off sales to new customers and still grow ~30% YoY for years given the cohort expansion graphic they show (more on that below). They also note they’re continuing to invest in adding more sales reps at every level of business to upsell current customers and sell to new ones. Customers paying more than $100K in ARR grew 54% over the past year. 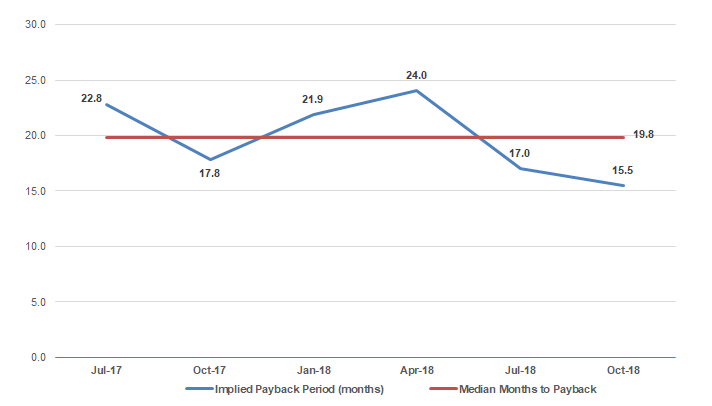 They don’t release customer counts by quarter but in terms of sales efficiency, their months to payback using a CAC ratio (implied net new ARR * gross margin / sales and marketing spend of prior quarter) was at a 20-month median over the past 6 quarters, which is quite strong for their scale. The last quarter was 15.5 months, the lowest number in the past 6 implying they’re gaining efficiency. PagerDuty has $128.3M in cash and raised $173.7M, implying they have only burned ~$45M to get to ~$125M in ARR, which is very impressive. Outputs of other metrics are below. PagerDuty has added $13.9M of net new implied ARR last quarter and $41.3M over the past year. The last quarter was their largest to date from the S-1 disclosure. 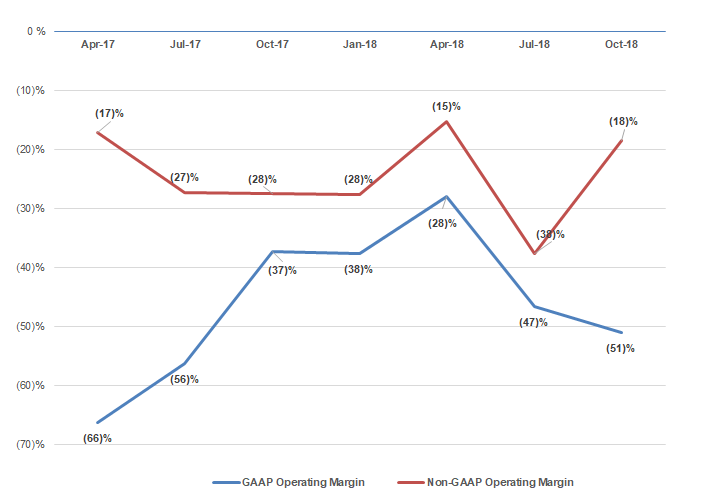 PagerDuty doesn’t release customer counts by quarter, but the below output plots their implied months to payback using a CAC ratio (implied net new ARR * gross margin / sales and marketing spend of prior quarter). The median is 20 months. 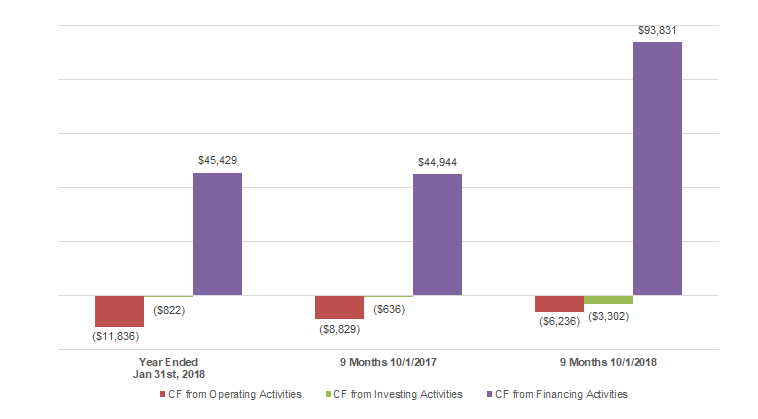 Unfortunately, this first S-1 filing does not disclose the numbers behind the cohort below (they are blank in the S-1), but the visual makes it clear that even the FY’13 cohorts continue to grow. This should give the public markets confidence that even if new logo acquisition is flat, customer expansion can continue to drive growth. 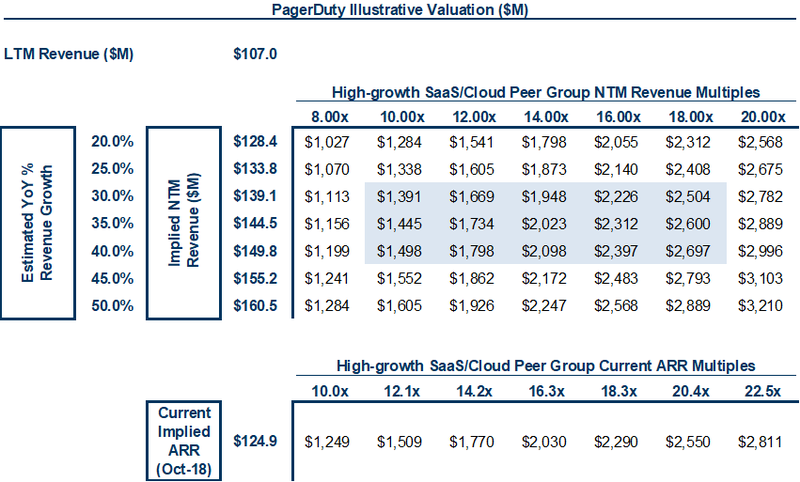 Like almost all SaaS IPOs, PagerDuty is likely to be valued on a multiple of forward revenue given their high growth and lack of profitability. The output below uses NTM (next-twelve-months) revenue as a proxy based on an illustrative range of growth rates (companies do not release projections in S-1's). Note they will release the full-year revenue number in a subsequent filing, but for this analysis, we only have revenue ending Oct-2018. 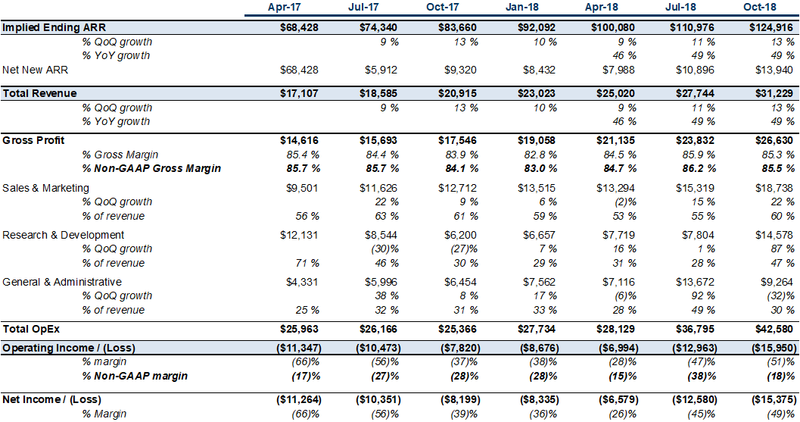 Below that is an implied ARR multiple range based on other high-growth public SaaS companies as a frame of reference (subscription revenue * 4). I bet PagerDuty is likely to trade significantly above their last private round reported valuation of $1.2B based on current public comps. While PagerDuty doesn’t offer an open source product, they primarily serve developers and have a very efficient self-serve go-to-market. And while revenue from new logos seems to have more moderate growth, expansion revenue appears to be consistent and continues to expand, even across older cohorts. The market for developers and anyone touching digital operations will also only continue to grow. PagerDuty is in a great position to continue to capitalize given they’re the clear market leader in the space. They should have a very successful offering.